Sometimes all it takes is a movie to open our eyes to some basic injustices. Yesterday I saw the Saudi Arabian movie Wadjda about a determined young girl—ten or eleven years old—who wants to have a bicycle so she can race with a boy who is her friend and neighbor. 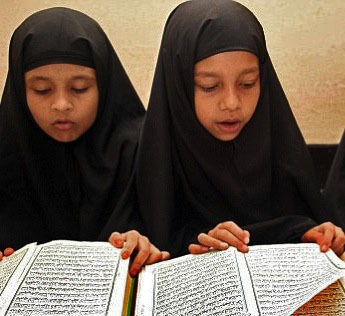 Saudi girls memorizing verses from the Koran. The movie gives us an intimate glimpse into the life of a lively Saudi girl. She has a quiet family life as the only child of a warm, caring mother and father, although the father is only with the family on weekends. Gradually we glimpse the stringent and seemingly meaningless restrictions on the lives of both Wadjda and her mother. In the girls’ school that Wadjda attends, the children are not allowed to play in the schoolyard when construction workers are working in the distance—the men might catch a glimpse of them. They cannot laugh or talk loudly because “a woman’s voice is her nakedness” and must never be heard by men outside of her family. Wadjda’s mother goes to work every day, but has to travel in a van with a male driver because women are not allowed to drive nor to walk on the streets. She and her daughter cannot even go shopping without asking the driver to take them to the store. Although pre-pubescent Wadjda is allowed to walk through the sandy lots of the city and to have her face uncovered (although her hair must remain hidden), we leave the theater knowing that far more restrictions await her when she grows older. Surely every American woman who walks out of the movie must wonder why Saudi women continue to submit to the stringent rules that limit their lives so drastically. There are a few far-off glimmers of hope for women’s freedom in Saudi Arabia. The king has proclaimed that starting in 2015 women will be allowed to vote and to run in local elections. That is a start. Most women, however, long for the freedom of driving more than they long for the vote. BBC World News reports that a new campaign asking for the right of women to drive has attracted more than 11,000 signatures. The day on which Saudi women are planning to take to the roads is October 26, 2013. To some activists, the right to drive seems trivial, but if you think about what it would mean to be unable to leave the house until some man can be found to drive you on any errand or visit, it’s easy to understand. Day after day women suffer the embarrassment, expense, and humiliation of being totally dependent on the wishes of a male who has the key to a car. Even though the number of Saudi women who have learned to drive must be tiny—only the educated members of a wealthy family would ever be able to learn—it is at least a start. When women have the ability to travel locally and to visit one another without supervision, who knows what independent plans they may foster? Those of us who live in the West should all support the Saudi women in their efforts. Let’s join together to hope that someday Wadjda could have not only a bicycle, but the keys to a car so she can grow into the kind of strong, independent woman that is needed in Saudi Arabia and the world. I’m glad you enjoyed the post and thanks so much for including a link to your blog. It’s wonderful! Those pictures of the cycling Dutch royalty are great. I’m recommending it to my cycling daughter and to many of my friends. Let’s hope the freedom to cycle spreads across many more countries over the coming years. Thanks for the reminder..of the liberties we have here in North America. I did mention here in a blog post that some Saudi women are allowed to bike but only in a restricted manner.